That Carol L. Cheatham, PhD was a scientist was clear to her family early on. At the age of 8 growing up on a farm in rural Wyoming, Cheatham conducted observational studies following the many farm cats around to find out (and diligently record in her notebook) where they would give birth. Once that got boring, she started trying to predict where the litters would be born based on her observations from the previous years. The cat research was harmless, and her mom was just happy that she was occupied out of the house (wandering your own acreage in Wyoming is still to this day a safe activity for children). In general, her family supported her scientific endeavors and even courteously paid attention to the endless stories of her exploits. However, she did get in trouble once for transplanting weeds from the sunny field into a spot next to the house to see if they would grow in the shade. This love of all-things-science continued throughout her life. Cheatham took a detour in her early adult life to start a family and pursue nonscientific work, finally returning full time to her education and science at the age of 35 as a single mother of a 17-year-old and a new baby. Her determination to build a life as a scientist was evident when she started driving her old VW Bug in Wyoming winters from her hometown to the junior college 60 miles away, five days a week. Some mornings she was making the first tracks through the fresh snow, but the excitement of finally exercising her scientific brain overshadowed all the hardships, from junior college to the four-year university (the only one in the state – the University of Wyoming). The biggest leap was her move from the town of 25,000 in Laramie, home of the university, to the University of Minnesota in the Twin Cities, which had a population of 2.5 million. Cheatham did not sleep much that first year as she adjusted from the crickets in Wyoming to the constant bustle of the city. But, thereafter, she adapted and built a good life for her younger daughter (then in first grade) and herself in Minneapolis – Saint Paul. 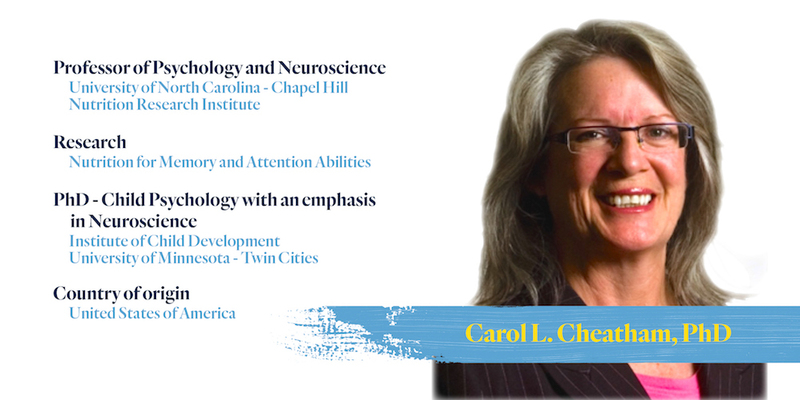 In September 2004, Cheatham earned her Ph.D. in child psychology with an emphasis in neuroscience at the Institute of Child Development, University of Minnesota – Twin Cities (rated number one in the nation by US News & World Report) with Patricia Bauer, Ph.D. and Megan Gunnar, Ph.D., both internationally renowned in their field. During her tenure at the institute, she studied the development of memory and attention with Bauer, while simultaneously studying the effects of stress and social support on memory development with Gunnar. Cheatham first became interested in the interplay between nutrition and brain development during her work with the chair of her dissertation committee, Michael K. Georgieff, M.D., a leading neonatologist who studies the effects of maternal iron intake on brain development. Even though her dissertation did not have a nutrition component, the mentoring she received from Georgieff was invaluable for the understanding of the effects of nutrition on the brain. In addition, she began to appreciate the value of interdisciplinary ventures and came away with a desire to seek collaborative opportunities that cross traditional lines. She subsequently accepted a position on an interdisciplinary project at the University of Kansas Medical Center exploring the effects of docosahexaenoic acid (DHA), a fatty acid, on cognitive development. Cheatham views interdisciplinary work as a pathway to a cohesive picture of brain development and functioning. During her postdoc, Cheatham came across a paper that talked about how what your mother ate during pregnancy could determine whether or not you developed Type 2 diabetes as an adult. Having had a strong attraction to behavioral genetics as an undergraduate, a field with a bad reputation at the time from which she was advised to steer clear, these developmental origins of disease data intrigued her. As fate would have it, that same day the announcement for a tenure-track position at the University of North Carolina at Chapel Hill’s Nutrition Research Institute (NRI) came across her desk – a position where one would be encouraged to pursue a career in nutrigenetics. She was subsequently hired as the first faculty member past the director. In her initial research at the NRI, Cheatham focused on the utility of the fatty acid DHA to influence information processing in the brain, and she hypothesized that background diet (e.g., the total fat composition of the diet) and the organism’s history (e.g., expression of genes) may be factors in that ability. Important to her work at the NRI is the ability to classify participants by variations known as single nucleotide polymorphisms in genes that are involved in the fatty acid metabolism process and are possibly introducing a confound into the data as people of a certain genotype metabolize fatty acids more readily than others. After a few studies, it became clear to her that no one nutrient acts alone. Thus, she is currently assessing the synergistic effects of omega-3 fatty acids, choline, and lutein on declarative memory using behavioral and electrophysiological (event-related potential) paradigms. Cheatham’s goal is to explain factors relevant to hippocampal development in children and hippocampal dysfunction in aging in adults. She believes that a focus on the nutritional aspect of brain research is key to discovering possible interventions that would help improve brain development in infants and children as well as slow cognitive decline in older folks, giving every child and older adult a chance to maximize his or her cognitive abilities. The little Wyoming girl with notebook and pencil has come a long way from farm cat research. Nonetheless, as a developmental cognitive neuroscientist at the NRI, science still drives, intrigues, and totally amazes her.